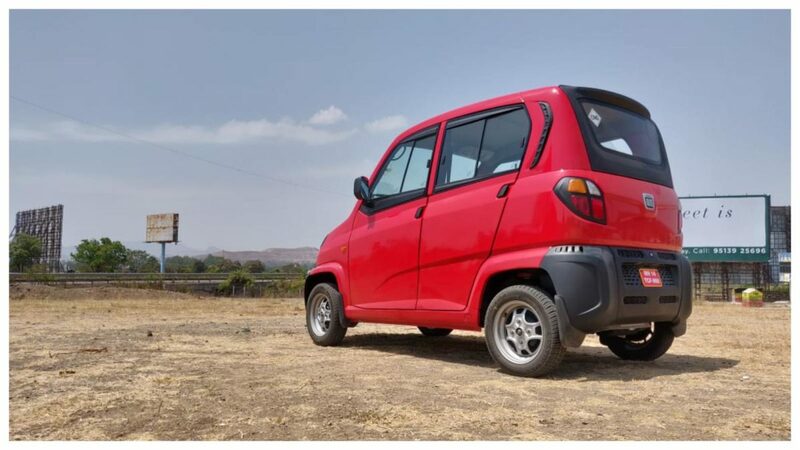 After battling it out with the Government to create a new ‘Quadricycle’ category of vehicles, the Bajaj Qute finally emerged victorious and will now be launched on the 18th of April, 2019 for the state of Maharashtra. Although it has four wheels, the manufacturer specifically mentions that it isn’t a car at all, and even with a ‘Cycle’ in its name, has nothing to do with a two-wheeler. So what is it? The Qute’s aim is to provide a commuting solution which has a small footprint, protects the occupants from the weather outside, is easy to drive, and affordable to own and maintain. The Qute got approval from ARAI after meeting the Indian Quadricycle norms. Incidentally, these are more stringent than the European Quadricycle norms. Not just that, it has also got the European WVTA (Whole Vehicle Type Approval) certification awarded by RDW Netherlands. 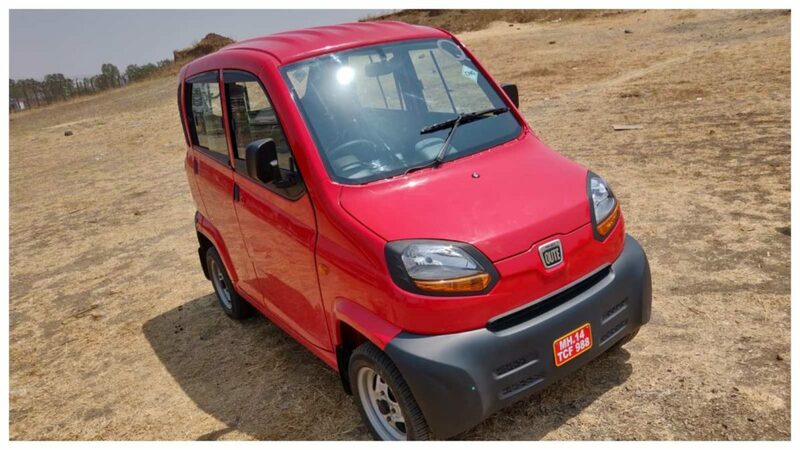 Powering the Qute is a 216cc, single-cylinder, DTSi engine which cranks out 13.1 PS @ 5,500 rpm and 18.9 Nm at 4,000 rpm. There’s a CNG version available too, where the same engine churns out 11 PS and 16.1 Nm. The motor is paired with a 5-speed sequential gearbox which is quite fun to operate and the top whack this Qute little thing can hit is 70 km/h. Other than that, there is no air conditioning since the cabin was too compact to fit a unit. However, an opening in the bumper channels outside air into the A-pillar, where vents disperse it inside the cabin. Quite an innovative thing to do, however, it doesn’t work when the vehicle is at a standstill and one would rather have it shut during peak summer. 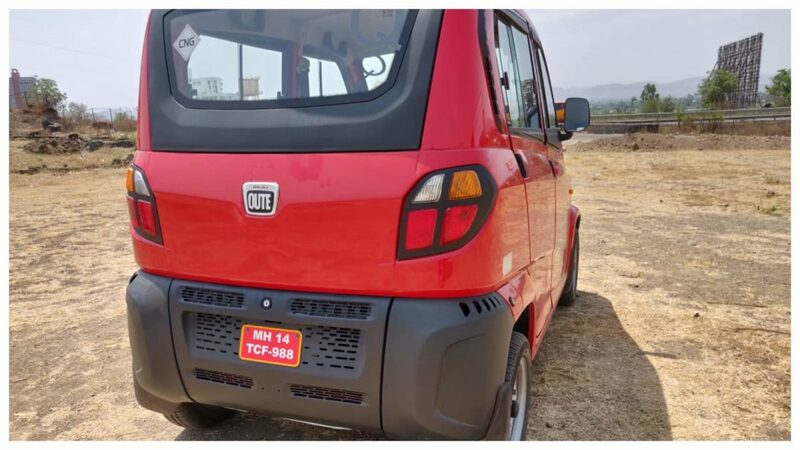 In terms of fuel efficiency, the Bajaj Qute’s CNG-powered variant can cover 40 km/kg, while the petrol-powered variant is rated for 35 km/l. What about safety? There is no ABS, airbags or any such aids to keep occupants safe. However, there are seatbelts and if you consider an auto rickshaw, the Qute if definitely a safer vehicle than that popular contraption. Upon launch, the Qute is expected to be priced above the INR 2.5 lakh mark. At that price, although an innovative idea, the lack of any creature comforts and the weather conditions in a hot country like India, do take away some of its practicality.